During the three days of the ITMO conference, I was delighted to attend, as a regular participants, sessions on ESP teaching. These were practical, active, hands-on, engaging sessions – exactly the kind of methods you’d like to think students would be experiencing! As with all good conferences, I couldn’t attend simultaneous sessions and so, sadly, had to choose some and miss out on others. 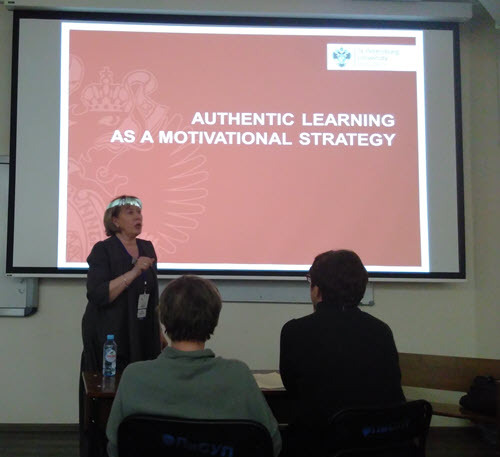 I enjoyed Head of ITMO Foreign Languages dept Yulia V. Ryabukhina’s session on Project and Problem-based learning (two different things), particularly as we were constantly questioned, asked to reflect, to think, to predict what happened with her real-life example class. 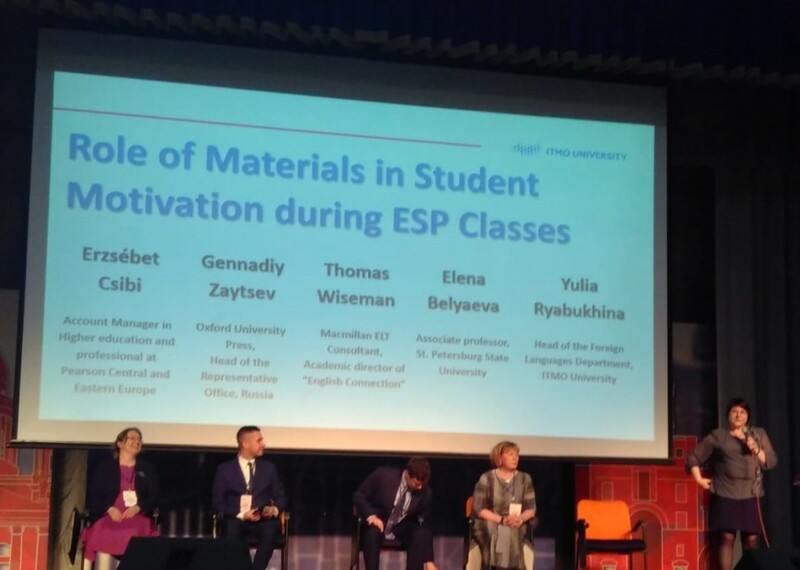 Yulia also chaired a panel discussion on the Role of Materials in Student Motivation during ESP classes. On the panel were representatives from three publishers and there was much talk of the huge preparation time needed to provide learners with interesting and relevant ESP materials. It occurred to me that Moodle users (and maybe non-Moodle users?) should have this problem alleviated with the advent of resource sharing in the new MoodleNet. It’s worth keeping an eye on the ongoing progress of this new, open, social media platform for educators. Elena Belyaeva of St Petersburg State University (and formerly my son’s manager!) did an excellent and interactive workshop on authentic learning for students. I was particularly interested in this because I know the difficulty of providing authentic materials for foreign language learners. Elena’s take on this was that she didn’t only mean authentic paper materials – but an authentic experience. So she took us through a typical experience her students have where they first discuss the benefits and drawbacks of studying abroad, they then research possible scholarships (with differentiated tasks and more or less assistance depending on their needs) and eventually will produce a scholarship application. It’s authentic because, as graduate physics students they may well be doing this. Elena even thought to make our own workshop experience authentic by having us research teaching scholarships rather than Physics graduate ones. (Sadly for me, one of them required Russian nationality!) In undertaking these tasks we first reflected on our own, then with a partner, then with a different partner – I was reminded of ‘think/pair/share’. This active, student-centred learning was very present in another workshop I attended – and unfortunately my poor photographic skills meant my pictures aren’t good enough to show. (Yes, they’re of even poorer quality than the ones I have chosen to show!!!) 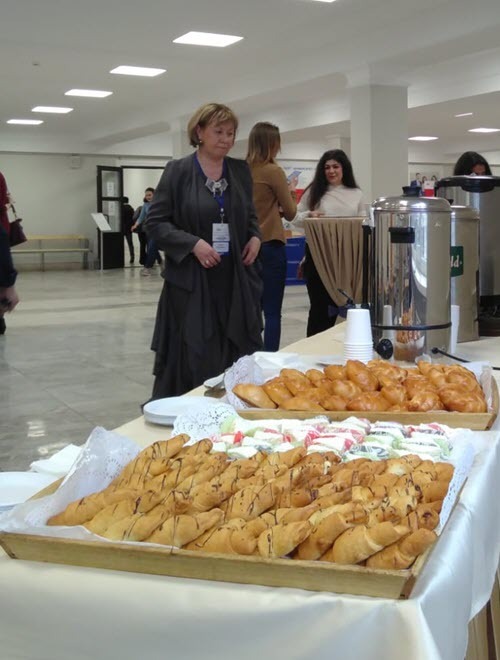 That’s a shame because the workshop was run by Aleksandra Shparberg and Maryam Reyhani (EMI co-ordinator) from ITMO University. (Maryam is from Perth Australia -home of Moodle!) The two delivered a masterful double act, from the first five minutes when we all had to get to know each other via paper aeroplanes to the last five minutes where we were each teaching the group about considerations in English as a Medium of Instruction. By the end I really, really wanted to be part of their department! I wanted to be a teacher again, to inspire and engage and all the things I had forgotten I’d enjoyed during my 28 years teaching. 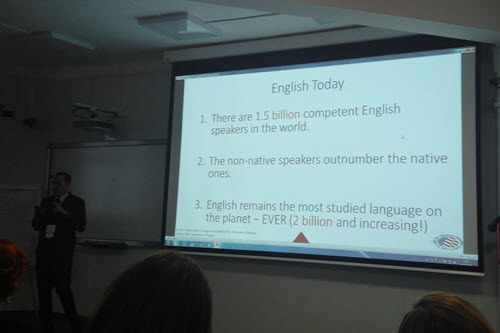 Robert’s presentation was full of interesting and entertaining facts and information along with many practical hints for getting the most out of your English language learning students. Big thanks to ITMO for allowing me to attend the conference. It was a pleasure both from a Moodle and a Languages point of view. And, of course, thanks for the lovely cakes!